Are the days of hearing that familiar ‘pop’ from a cork being pulled out of a bottle of wine nearly over? I sincerely hope not. For the true enthusiast, the wine screw cap should not take over from the cork for many reasons, first and foremost is the environmental one. 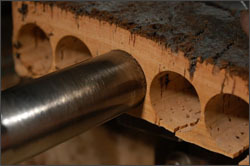 Corks for wine bottles come in a few different guises, natural, synthetic and a combination of the two. About 70% of the worlds natural cork is produced from the large cork forests in southern Portugal, which includes approximately 15 billion corks for wine bottles (as well as other types of cork product). Why is it so important to save the cork? Cork extraction is an environmentally friendly harvesting processes as not a single tree is felled in order to get the cork. The forests in the Mediterranean have provided ecosystems that have coexisted for at least a thousand years. There is a tradition at stake. The forests, apart from supporting all the labour connected with the industry, also coexist with livestock and wildlife which graze under the cork trees. Honey is made from beehives located within the forests, while acorns are used in the production of animal feedstuffs, not to mention the array of fruits and berries that grow in the wild. This is real sustainable agro-forestry at work, people use the natural resources whilst at the same time preserving the ecosystem’s environmental values. Should the screw cap closure become more popular leading to a decline in cork demand, this would be disastrous for the regional economy and ecosystems, and could have dire consequences for the whole of Europe. During the 1980’s, farmers were encouraged, by EU subsidies, to switch to more intensive crops like maize, which resulted in large areas of cork forest being cleared. Wine drinking became more popular, heralding an increase in the demand for cork bark. With the reduction of productive forests many factories were unable to keep pace with the demand, so hygiene and quality standards fell. A cork taint problem was encountered in a big way caused by trichloroanisol (TCA), a naturally occurring chemical found on wood and other vegetation. The TCA caused a musty aroma and nasty taste in the wine leading to the loss of literally millions of bottles. Complaints of corked wine were on the increase. Many Australian and New Zealand wine producers felt the time had come to look for another type of closure. and soon the synthetic cork made its debut. They proved to be popular and were cheaper to produce, but the main drawbacks were that they were notoriously difficult to extract, and they don’t protect the wine from oxygen as natural corks do. This means that wines sealed with synthetic corks have a poorer shelf life and therefore should be drunk young. The start of the screw cap revolution from the antipodean countries came in 2000. Some winemakers from the Clare Valley in Australia grouped together and released their Riesling wines under screw cap. Now about 75% of Australian wines and 95% of New Zealand wines are sealed in this way. Wine Cork or Wine Screw Cap? Both corks and screw caps have their place as good wine bottle closures. Good quality red wines should be sealed with high grade corks which allow the wine to breathe and age well. It has long been known that much of the best cork is bought up by the worlds top red wine producers exactly for this reason. For commercial wines, sealing with screw caps could be economically wise as many of these wines are made to be consumed while still young. Consumers in several countries, including the UK, were keen on this method, especially as is more convenient to twist the cap off than to mess around with a foil cutter and corkscrew. Many winemakers did not comprehend that the screw cap as a closure is quite different from cork as it forms a tight seal that doesn’t allow much transmission of gas. So screw capped wines had avoided the cork taint problem but at the same time displayed an off aroma known as ‘reduction’. The two camps had their own set of issues but winemakers are now using both types alongside each other. Cork has lost its monopoly for the time being but it is the ‘natural’, sustainable option, and has much a lower carbon footprint than the aluminium caps. I don’t think that the days of cork are over, nevertheless, they could still be numbered. For environmental reasons we should definitely support those producers still using corks and keep enjoying that traditional ‘pop’! To learn more about wine this is a good place to start – Understanding Wine: A Beginners Guide. Ever made Homemade wine before? Don’t know how to, why not visit: http://winemakinghome.blogspot.com. This entry was posted in cork, wine and tagged corks, screw cap wine bottle, screw cap wines, screw caps, screw caps wine bottles, wine bottle caps, wine bottle screw cap, wine bottle screw caps, wine caps, wine closures, wine cork, wine corks by Rob Hemphill. Bookmark the permalink. Great site! I love wines and prefer the cork! The twist off tops were always associated with the cheap wines but, I see more and more of them on shelves here in California. Thank you for such an informative and interesting journey through the wine making process. Great post, the debate between corks and natural closures has been a heated one for sure. However, not many people bring up the socio-economic impacts that abandoning cork would have on places like Portugal. I prefer cork over anything synthetic first because of the micro-oxygenation you alluded to but also because of tradition. As a winemaker I can say that putting a real quality cork into my bottles of wine just feels right. I know that my wine is safe with the natural cork. While some corks do go bad most don’t.